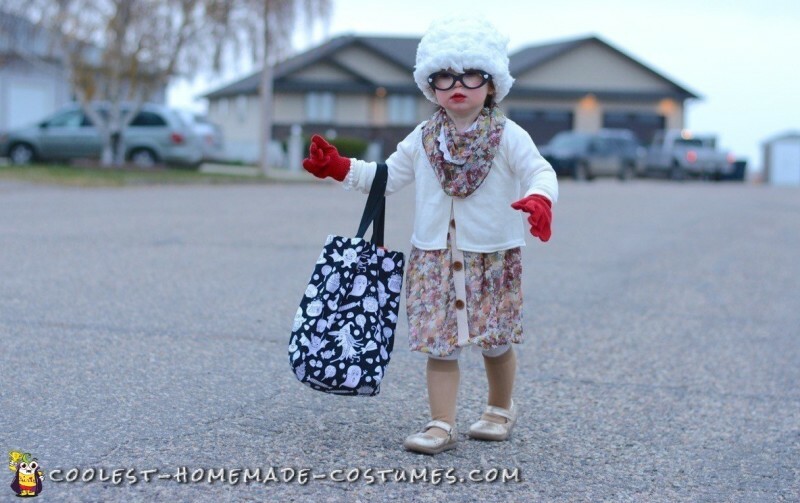 This toddler old lady costume was inspired by my mom (my daughter’s Grammy). It was her idea and although I thought it was lame at first, the idea stuck so we decided to give it a try. 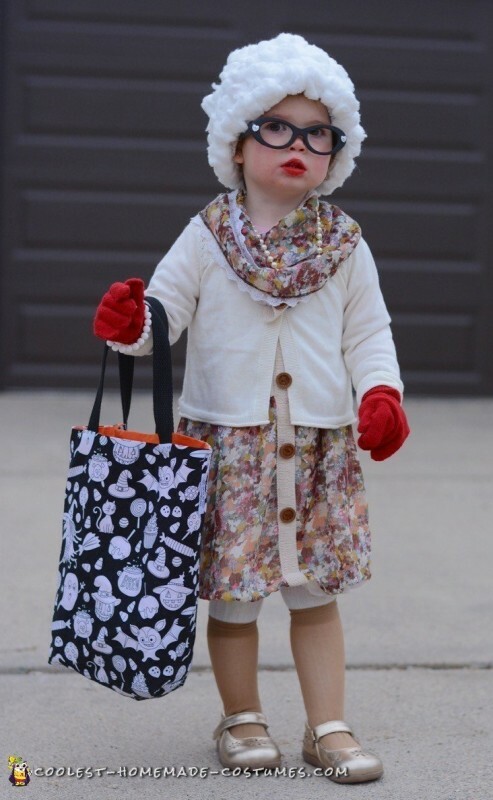 The supplies included a dress from Value Village, bag of cotton balls, sock nylons, sunglasses, necklace, sequin, hot glue, needle and thread, Mary Janes, sweater, white toque, gloves, bracelet, leotards and makeup (red face paint for lipstick, blush and eyebrow pencil). We went for the “wow” factor with the lipstick, so we ended up just putting red face paint on top of the lipstick. Her nails were also painted red, but it is chilly here so gloves were a must! The dress was made mini for a 2 year old. The bottom part was cut off and used as an infinity scarf. The sunglasses lenses were popped out, the frames painted black and sequins glued on to each side. I sewed all the cotton balls onto a white hat with a needle and thread. I was about 10 short, but luckily our neighbor had some! The hat took a while, but it was so warm and my daughter loved it. Made me laugh every time she put it on. Everyone loved the costume so much and recognized it from seeing photos of similar ones on Pinterest. Several people made comments that they had thought about doing it, but never did. This time is was a Pinterest success for us vs the many Pinterest fails we have had! Since it was inspired by my mom we kept telling my daughter that she was Grammy! She’d light up and smile when we told her that! Making homemade costumes was a large part of my childhood and something we always had a lot of fun with. I am excited to be able to share this tradition with my daughter.